On Tuesday, August 30th the Board of Directors of Bank of Nova Scotia announced an increase to their quarterly dividend. The new quarterly payment is $0.74 CAD per share compared to the previous payout of $0.72 Cd. That's a solid 2.8% increase. Bank of Nova Scotia is a Dividend Challenger based on their home currency with 6 consecutive years of dividend increases. Shares currently yield 4.24% for U.S. investors. Bank of Nova Scotia has typically given investors 2 smaller dividend increases each year rather than just one larger one. For me that's awesome because it allows the raises and compounding to come just a little bit faster. Compared to the year ago period Bank of Nova Scotia has increased the dividend by a total of 5.7%. Since I own 25 shares of Bank of Nova Scotia in my FI Portfolio this raise increased my forward 12-month dividends by $2.00 CAD or $1.53 at the current CAD:USD exchange rate. This is the 3rd dividend increase I've received from Bank of Nova Scotia since initiating a position in March 2015. Cumulatively my income from Bank of Nova Scotia has increased by 8.8% ex-foreign exchange!!! That's from dividend increases alone. According to USInflationCalculator the total rate of inflation over the same time period is just 1.5% so Bank of Nova Scotia is far exceeding inflation with pay boosts. Bank of Nova Scotia had increased dividends every year since at least 1994; however, the financial crisis ended that streak. Personally I feel that was a prudent decision because no one knew what was going to happen so erring on the side of caution made the most sense. Dividend growth historically had been very strong, but since the financial crisis has settled in around between 6-9% annually. That's still solid though and if they can continue to keep that up I'll be an extremely happy shareholder. Bank of Nova Scotia has maintained an average payout ratio of 48.5% over the last 10 years. 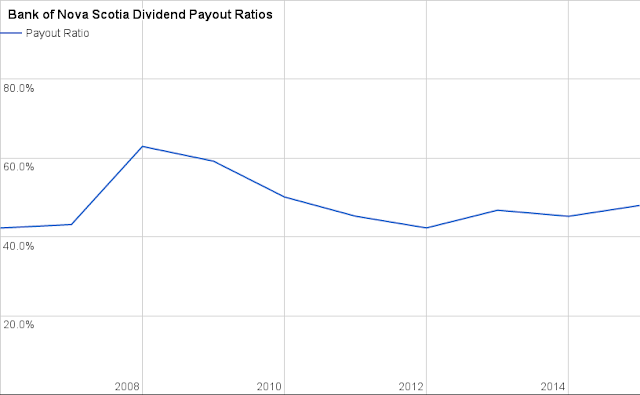 Moving forward I would expect dividend growth to track earnings growth with a possibility of slightly faster growth, but overall the payout ratio should remain around where it currently sits. The Canadian banks are typically more conservatively run than their U.S. counterparts and the big 5 have a huge portion of the market share. But don't think that Bank of Nova Scotia is solely reliant on the Canadian economy as they have a big presence in Central and South America too. They recently announced Q3 earnings and Ben over at Sure Dividend has a good write up covering the release. My forward dividends increased by $1.53 with me doing nothing. That's right, absolutely nothing to contribute to their operations. Based on my portfolio's current yield of 2.97% this raise is like I invested an extra $50 in capital. Except that I didn't! One of the companies I own just decided to send more cash my way. For a dividend growth investor there's not much that's better than hearing news of a dividend increase. So far this year I've received 35 increases from 28 companies increasing my forward 12-month dividends by $202.82. My FI Portfolio's forward-12 month dividends increased to $5,651.56 and including my higher Loyal3 portfolio's forward dividends of $65.06 brings my total taxable account forward dividends to $5,716.61. Do you own shares of Bank of Nova Scotia? Do you prefer multiple smaller raises throughout the year or one larger increase?